Ad extensions, as their name indicates, are a type of ad format that displays extra information about your business, in addition to the typical text ad structure, which includes the headline and description. Ad extensions tend to improve your ad’s visibility and may help you increase your total number of clicks by improving the click-through rate (CTR) of your ads. 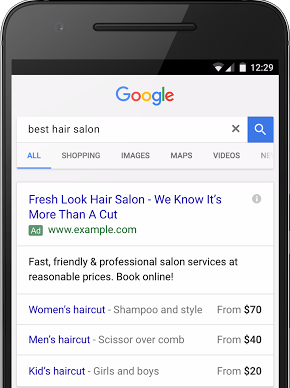 In this blog post, we will review the main ad extensions you can use while managing your campaigns in Google AdWords. 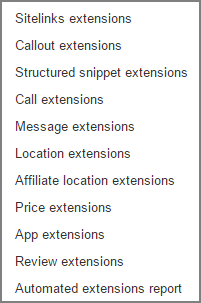 Sitelinks extensions allow you to include in your ad up to 6 additional links to different pages on your website. Using this extension will allow your customers to easily navigate to the pages they are most interested in. Examples of common uses: Store opening hours, store locations, popular services, top selling products, contact details, etc. If your business offers free returns, 24-hour customer service, free deliveries or any other service you would like to promote, callout extensions are the place to do so. Any additional information you would like to emphasize in order to let your customers know about your business’s added value can be launched as a callout. 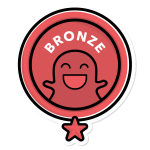 Make sure you are not distracting users from the main title of your ad, but let them know about complementary products or services through this feature. In this type of extension, you are able to add a line to your ad, and enter some values representing the services or products you are promoting. The categories are called headers, and you can choose one of the 13 headers Google suggests, such as Service Catalog, Brands or Types. Each header is taken from a different industry, so you might want to explore the various suggestions and decide which is the most relevant for your business. 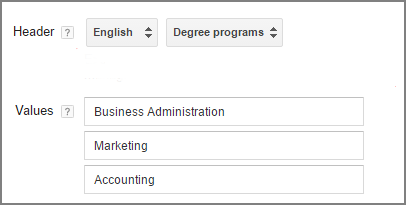 For example, if you are an educational institute, you would probably want to use the ‘Degree programs’ header and add the main programs you are offering at your institute as your values. Connect people directly to your business by displaying your phone number. This is one of the first extensions ever rolled out – it allows a business to add its phone number in order to receive direct calls from users. Given that most businesses have adapted to mobile users, you might want to consider adding your phone number in order to shorten the time it will take customers to reach you. 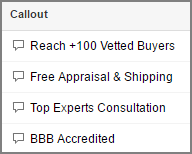 Recently (February 2017), Google rolled out a feature called bid adjustment for Call extensions, which may help advertisers control the bids and the impression share of this extension, on top of others. Include your business address alongside your ad. Help your customers find and visit your business. This feature is ideal for local businesses with physical addresses looking to drive foot traffic into their stores or locations. Price extensions allow you to add a price for a product or service of your business. This feature can save users’ time while they are searching for a price of a specific product or service, but bear in mind that it can have a negative affect or cause users not to click on your ad, as they already received all the information they were searching for. Hence, it is important to think deeply about your creative and the suggested value proposition within the ad. While Seller Ratings are an automated extension type that showcases advertisers with high ratings, and are only shown when a business has 150 unique reviews and a composite rating of 3.5 stars or higher, review extensions give you the opportunity to manually share positive reviews, testimonials or awards below your standard text ads. If you are willing to use a review extension, you must provide a direct quote or summary of a key point from a review taken from a “reputable” third-party website, and use it to promote your business. Let’s say you are searching for “The best ASO agency” in Google. In summary, though most advertisers are familiar with ad extensions, not all are taking into account that these extensions allow them to add, free of charge, some extra pieces of information about their business, and give customers more reasons to click on their ads. Moreover, Google is frequently making changes and adjustments in order to bring more value to the ads for both advertisers and customers, alike. One of these recent changes is the rollout of the swipe-able card carousel, which combines multiple ad extension types into one. So, next time you are thinking, ‘how can I increase my CTR and drive more traffic from my paid ads to my website?,’ remember that ad extensions may provide more real estate within search results and help your ad stand out and look more credible. 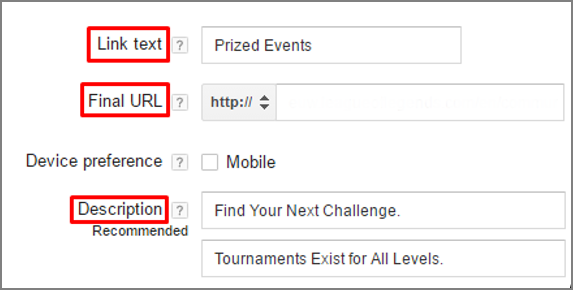 Want to find out more about ad extensions and PPC campaigns in general? Contact us.